Each of the past 46 (webgal note: it's really 26) Decembers, Jim Watson has carried his acoustic guitar, songbooks and lyric sheet handouts to Chapel Hill’s Cave, and invited all to join in an evening of Yuletide cheer. Watson’s Christmas singalongs have helped make “the season to be merry” ever more so. Last year’s concert, recorded live by the Rubber Room’s Jerry Brown, is an early 18-track gift that will brighten days and nights leading to the arrival of Old St. Nick. 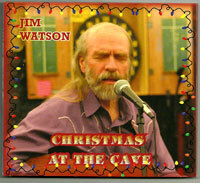 Jim Watson’s Christmas show will take place Dec. 21at the Cave, and Dec. 23 at the Depot in Hillsborough. To order “Christmas at the Cave,” send a $17 check to Jim Watson, 132 Justice St., Chapel Hill, N.C. 27516.